Unsure? Check out our FAQ for more information. Use of the workspace anytime. A dedicated space / deskspace just for you. 350mb+ High-speed, fibre optic secure internet. Tea & Coffee plus suprise snacks found in the kitchen. Access to printing & scanning facilities. Live Chat or call us +44 01509 390 282. Local Train Station - 5 mins walk. Daily trains direct to London, Derby, Nottingham, Sheffiled, Leicester, Birmigham & villages. Bus Station - 5 mins walk. Direct buses East midlands Airport, Leicester, Derby, Notthingam and nearby villages from this nearest bus station. Within a few minutes walk you will find cineworld, Bars & Clubs, Restaurants & other entertainment venues. Just a short walk away you can find popular fast food and dinning experiences. Such as McDonalds, Nandos, Pizza Express, Fenway's and many other. Down the road, we have our local gym BOX or 5-10 mins walk you can find Pure Gym or Anytime Fitness. Free Street & Residential parking or paid private parking aviable. 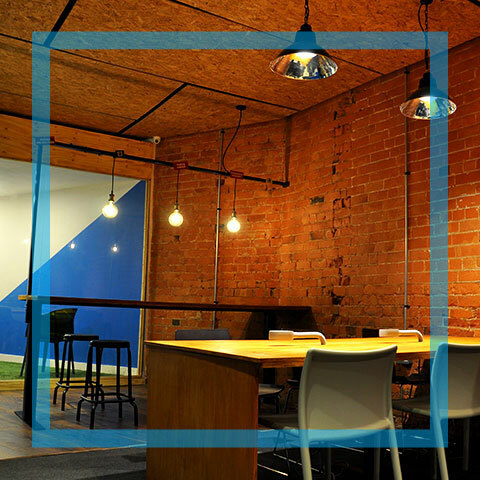 A creative co working space with open desks, access to power, phone booth, meeting rooms, kitchenette access, personal lockers, mail services, VOIP services. With business services available on demand to help you grow. You can request to visit us on our site by clicking the visit us button and filling in your contact details. We will get back to you asap. Also daily memberships are bookable online the same day of use, or the day before. For all memberships payment is required prior to the use of Co Lab. The daily membership is payable on the day or day before use via online or at reception. The Flexible plan is a monthly direct debit which can be cancelled with 1 months notice. The Dedicated plan is a monthly direct debit which can also be cancelled with 1 months notice. Please contact your onsite manager in order to cancel a membership. Spacious room with a range of bookable facilities. Designers, modellers, workshops and 3D printing. Local and international telephone infarstructure. Curated calendar of events and networking. Tea & coffee plus suprise snacks found in the member's only kitchen. On site printing facilities up to A3 Colour. Available as an add on on top of memberships. On site help and advice when you need it.